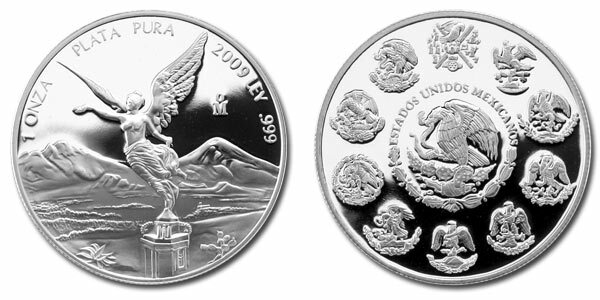 The Mexican Libertad silver bullion coin was first minted back in 1982 by one of the world’s oldest mints. The National Mint of Mexico (Casa de Moneda de Mexico) was established by Viceroy Antonio de Mendoz in the 1500s under orders of the Spanish crown. This mint was the first mint to be established in the Western Hemisphere after the conquest by the Spanish of the Aztecs Empire. The Libertad features superior design and quality, and is seen as one of the most affordable silver bullion coins in production today. The National Mint of Mexico turns out both silver and gold bullion Libertad coins that are available in a range of weights. The troy-ounce size is the most popular and most available coin in this series. The Mexican Libertad Silver Bullion Coin is struck in pure .999 fine silver and is easily one of the most recognizable bullion coins in the world. Since its inception in 1982, the Libertad has followed one basic design, although there have been a number of different versions of the coin. All versions look a lot alike, which can confuse first-time Libertad buyers. The initial design featured the Mexican coat of arms on the obverse, which is an eagle perched on a cactus, eating a snake. This design was used up until the year 2000, when the obverse began to feature the coat of arms surrounded by heraldic designs of significance to Mexico. The reverse of the coin from its initial mint date of 1982 through 1995 featured a winged goddess. In 1996, the design was changed to feature the same goddess, Victoria (who personifies good powering over evil) from a different angle. From a collector’s point of view, the earlier Libertad coins usually bring a higher premium because there were fewer of them minted. The Silver Libertad is sold at a premium over the spot price of silver, much like any other bullion coin that is issued by a government. This premium is usually around the same ($2.5-$4/oz) as other coins in its league, such as the American Silver Eagle. Premium will vary from dealer to dealer, and are also based generally on the method of payment and the number of coins being purchased in one order. Mexico is one of the world’s most important silver producers, and Mexico has historically been a huge source for silver, with estimates of more than 10 billion ounces of this precious metal being mined in Mexico over the ages. According to the United States Geological Survey, Mexico mined around 160 million ounces of silver last year alone. Silver deposits in Mexico have provided a rich supply of silver for hundreds of years, allowing the National Mint of Mexico to produce a huge number of coins over the years, including the globally circulated Spanish dollar during the 1600s and 1700s. The Libertad series allows the National Mint of Mexico to continue its long history of minting some of the planet’s finest silver bullion.